Executive summary: A Thames crossing from Jackdaw Lane to the Thames towpath would damage the much-appreciated quiet and natural ambience of Aston’s Eyot, and be detrimental to wildlife; benefits would be greatly outweighed by disadvantages. It lacks both local and land-owner (Christ Church’s) support, and so spending money on a feasibility study would be a waste of resources. The scheme would involve creating a presumably tarmac track, possibly lit, across Christ Church land at Aston’s Eyot from Jackdaw Lane to the Thames, and there building a bridge across the river to near the University boat house, to the towpath and the track to Eastwyke Farm/Four Pillars hotel and thence to the Abingdon Road. At present Jackdaw Lane is linked to the near Thames/Isis bank by an old gravel track that survives from the time (c.1910-1950) when Aston’ Eyot was, in the words of Dorothy Sayers, the “Corporation Dump”. The gravel track leads round southwards parallel to the Thames and then inland to a footbridge to City Council land at the Kidneys. Aston’s Eyot is 30 acres/12ha of former landfill tip that was capped around 1948-50 and, with intervals of grazing and sport use earlier on, has gradually developed into an area of mixed plantation, woodland and scrub that we see today. Unlike the tidiness of city parks, this is a wild area which had been colonised by a great variety of wildlife. It belongs to Christ Church college and has been open to public access since 1974. It is very widely used and appreciated by local residents for dog-walking, bird-watching, peaceful strolls, jogging, picnicking, and generally getting way from the bustle of urban East Oxford. For an urban site the wildlife is very rich, with deer (roe and muntjac), foxes, badgers, rabbits and 4 species of bats amongst mammals, at least 32 species of breeding birds (including declining species cuckoo and songthrush), many moths and butterflies (including the rare brown hairstreak), frogs, toads, slow worms and grass snakes. It is part of the important green/wildlife corridors along the Thames and Cherwell that make Oxford an unusually wildlife-friendly city – as has been recognised in numerous City and County Council reports. Apart from the many who appreciate the wildlife, the Eyot is used very extensively by large numbers local dog-owners, is a regular place for local people to walk or jog without vehicular interference, or to sit quietly by the river. The simple fact of it NOT being a through route to anywhere is one of its major attractions. As indeed would be its purpose, a purpose-built cycle track and bridge would generate considerable foot and cycle traffic across the Eyot. This would not only be on the formal track from Jackdaw Lane, but would also generate increased transits via the Kidneys around the peripheral path leading to the bridge from the south – i.e. by no means all the increased transits would be on the track proposed in the Council’s scheme. As anyone who used Meadow Lane or the Thames towpath on foot already knows, the volume and speed of cycle traffic often makes walking an unpleasant experience. The development of what would in practice be two new cycle routes to the new bridge (the official one from Jackdaw Lane, the informal one fro the Kidneys) would totally alter the ambience of Aston’s Eyot from being a quiet backwater to a busy through-way like Meadow Lane and the towpath. It would probably rapidly lead to a demand from cyclists that the Kidneys route be upgraded to a ‘proper’ tarmacked cycleway, thus further impacting the environment of the Eyot. Although illumination has not been mentioned, if street-lighting was included in the scheme it would further urbanise the Eyot, and have a seriously deleterious effect on wildlife. Over the years one of the downsides of Aston’s Eyot has been its use by rough sleepers and drug abusers. In recent years action by Christ Church, the police and the Friends has reduced its attractiveness for these activities, and enabled people formerly somewhat leery of walking there to feel safe. Provision of a through cycle route, would create a way for East Oxford drug dealers, who notoriously use nearby streets such as James Street for their ‘business’, to rapidly escape on bicycles without the possibility of vehicular pursuit. It would also increase accessibility to those who already use the area for clandestine activities – raves, camping, drug-abuse etc., and thus increase it again. Hence police opinion on this scheme should be sought and carefully considered. The impact of a through-way on wildlife directly is hard to assess. If it was open 24 hours the nocturnal animals that use the area (deer, badgers, foxes) would find their site split by a busy cycle-way, which, if lit, would be a major restraint on their movement. Some of the wildlife on the site, such as tawny owls and badgers, will only be there because nocturnal disturbance is low. Substantially increased passage of people in the daytime, whether on foot or on bicycles, let alone any motorbikes trying it on, would disturb birds in the breeding season, and make a band around the track(s) a nest-free zone. Birds sensitive to disturbance, e.g. sparrowhawks, buzzards, kingfishers, might leave the area altogether, reducing the biodiversity that other aspects of the Local Plan hope to encourage. Is the scheme necessary or cost-effective ? To spend up to £10,000 on a preliminary study implies that someone thinks the scheme is viable and should be pursued. But given the overall financial limitations is this the best use of council-payers’ money in relation to cycling. There are numerous other less damaging schemes in the document that require feasibility funding, and given that main functions of the proposed bridge would be link East Oxford with the city centre and South Oxford, surely the improvements at The Plain and donnigton Bridge outlines in the report should have a higher claim on any money. would be 1.75 miles. Distance travelled on roads using this route to station would be greater than using existing routes.” Thus from much of East Oxford this route would unsuitable for going to the town centre, though it would have benefits going to West or South Oxford from the Bullingdon road area. Given the proximity of Donnington Bridge, going that way as an alternative to straight down the Iffley or Cowley Roads is not a major imposition on a bicycle, and we would question whether spending £2m on a controversial and unnecessary (if semi-useful) new bridge is money well spent. Do people support the scheme ? There has been too little notice to conduct a public survey in relation to the current surfacing of the scheme. However when Iffley fields residents were asked in 2001, they strongly opposed any such bridge: a survey, and a weekend meeting at the [Isis] school – 3 people out of 125 gave conditional support for the Bridge while 40 people opposed it (see Appendix 2; however the formal submission did not give the actual figures). There is no reason to suppose local views have changed, but lobbying from Cyclox and other cycling enthusiasts (notably amongst councillors) might lead planners not familiar with East Oxford to believe that such a bridge and link would be universally supported – this is very definitely not the case. If money is to be spent on a feasibility study an most important aspect would be survey local opinion on the desirability of the bridge/link project. However unless the landowner, Christ Church college, agrees to such a bridge over the Thames, the idea is dead in the water. In 2002-2 they opposed such a project, and we have reason to suppose their current view remains the same. We note that someone has already jumped the gun – see Appendix 1: an architectural student at Nottingham University (!) was given a project in February 2012 or earlier to “to design a new pedestrian and cycle bridge over the river Thames to the south of the city centre.” So confident was he of local support, that he asked the Friends “What preferred landing spot along the Aston Eyot do you have, so as not to cut down any protected trees…”. Er, no preferred spot. But how would Nottingham University be aware of cycle routes in East Oxford ? In conclusion we submit that spending any money, let alone £10,000, on a feasibility study for this Jackdaw Lane bridge project is a waste of resources, unpopular locally and likely to be vetoes by the landowner. Chair, Friends of Aston’s Eyot, 20 May 2012. I am an architectural student from the University of Nottingham and we doing a project proposal designing a pedestrian bridge across the River Thames / Isis. We found out about Aston Eyot and Friends of Aston Eyot from the leaflets when we visited the site. The project brief is to design a new pedestrian and cycle bridge over the river Thames to the south of the city centre. This proposed bridge is part of a wider strategy for a new route, which includes a second proposed new bridge close to the Ice Rink. The route created by these new bridges will link the Eastern suburbs to the train station and a proposed new development to the West of the city centre, also linking up with existing cycle paths. In addition this will provide a safe and pleasant alternative route for cyclists to traverse the city and may encourage those who do not feel confident enough to cycle on busy roads. We would please like to know you opinions on the effect this bridge will have on the area? What preferred landing spot along the Aston Eyot do you have, so has not to cut down any protected trees, and if a proposal of growing back any cut down trees will work? Thank you very much, I will be happy to answer any more questions you have. View of the floods of 2007. 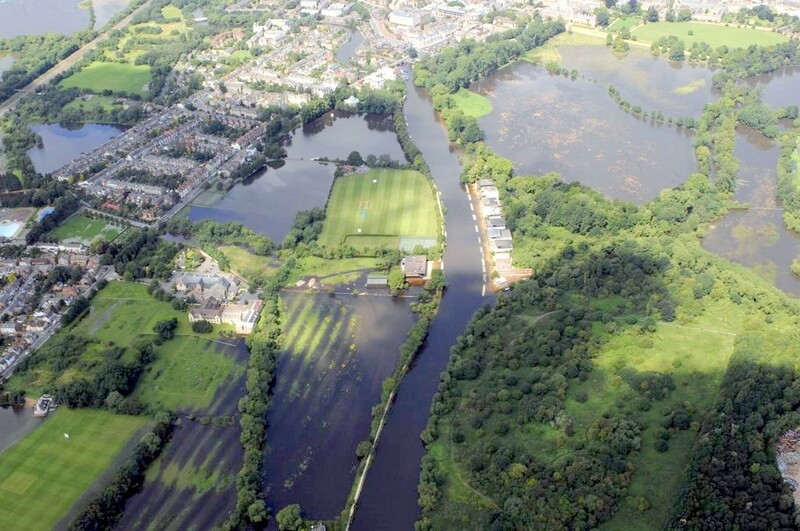 Note that Aston’s Eyot itself (in the bottom right quarter of the picture) is not flooded, due to the increased height of the land because of its use for many years as a rubbish dump. Also very clear, to the west of Aston’s Eyot, is a large area of ‘ridge and furrow’, evidence of the medieval system of strip farming – it’s amazing that such an ancient rural landscape it still apparent so close to the centre of Oxford. Eastwyke Farm Road – a close shave! 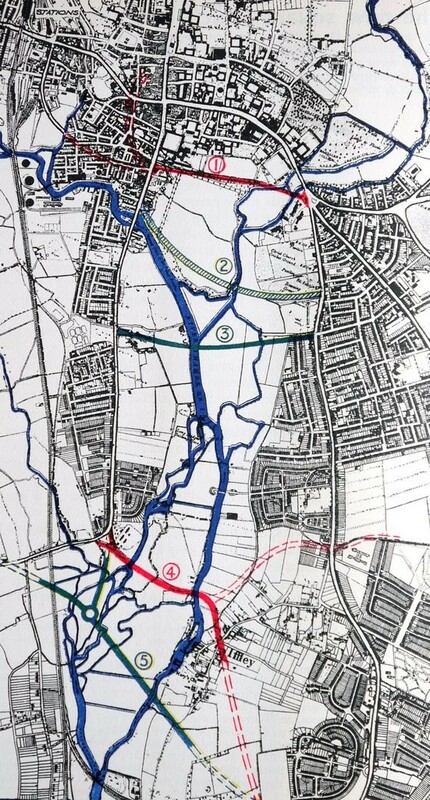 One of the proposed routes for a relief road from East Oxford to the west of the city – the ‘Eastwyke Farm Road’ – would have cut across the north of Aston’s Eyot (option 3) – only marginally less destructive than option 1 through the middle of Christchurch meadow!! from Thomas Sharp’s 1948 book Oxford replanned). However the idea of an additional route from Jackdaw Lane was revived in the later 1960s, blighting planning and housing across a swathe of East Oxford – only the financial crises of the Wilson-Callaghan government in 1978 finally killed the scheme, when money for road plans dried up (see Annie Skinner’s 2005 book Cowley Road – A history for more details).. More recently the idea has been revived in the form of suggestions for a cycle bridge at the same spot – see above under ‘A Bridge at Jackdaw Lane’.